I call Alex Busher at Edmiston for more details of the sale of Perini Navi's 53m sailing yacht Independence and Alex is quick to point out that Will Bishop at Yachting Partners International represented the buyer in the transaction. Ann Avery at Northrop and Johnson was Alex's joint central agent for sale of this superyacht. Independence was launched in 1998 and refitted in 2001/2002 and again as recently as 2008. ABS classed and MCA compliant her interior, designed by Perini and Bud Baty, sleeps up to 14 guests in a master, three doubles, two twins and two Pullman berths. 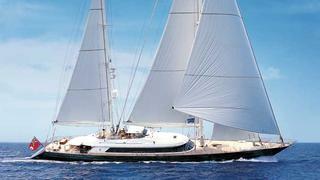 She cruises at 13 knots, has a range of 2,900 nautical miles at 12 knots and was asking $24.95 million.